One morning, as I was peacefully drinking coffee and reading the paper, my husband unexpectedly asked me something: “Why do you have little ‘x’ marks on your earlobes?” Without an answer for such a strange question, I ran to the bathroom and peered at my ears. The lobes were, in fact, marked by little “xs.” For those of you under 40, take heed: because one day, this will happen to you. (Surely my admiration for Madonna during the '90s — which led to four piercings per ear — has made matters worse.) The fact remains that age has hit my ears, and around each piercing, the skin is starting to sag and wrinkle. Of all the areas to betray us, our earlobes are likely the last that we would suspect — but there’s a good chance that some of your own beauty mistakes are responsible. Consider: we are all so diligent about pampering our bodies with various anti-aging lotions, but we often neglect our ears. This, plus the wear and tear of earrings (coupled with sleeping in them and other careless behavior) can end up creating a stretched-out and wrinkled lobe. Before you completely panic about any possible ear aging, please remember that only you (and possibly the person to your direct left or right) will notice. Having your lobes professionally corrected with surgery is only for those who are truly bothered by it. Nobody can see your ears from head on, especially when you are wearing earrings. However, if you are legitimately upset by them, there are solutions. Another easy method to avoid long-term damage is to always take out your earrings before bed. This will help you avoid stretching and possible tearing of the flesh. Over time, wear and tear from heavy earrings — and wearing them while you sleep — can cause the holes in your ears to elongate and stretch. Coupled with gravity, this can cause permanent damage. It’s nearly impossible to address advanced damage with topical treatments, so if you’re in search of a less invasive method, you might be curious about those lobe-saving stickers that are said to reduce the weight of your earrings. I asked Dr. Brooks if I could have avoided my “x” ears if I had used these tools. The corrective surgery for super stretched-out lobes is a bit more in-depth than the previously mentioned technique used for nearly-split piercings. A plastic surgeon removes what looks like a pizza wedge of flesh from the bottom, then stitches it up. However, this is a procedure best for those that have a real issue with their ears. “Even though ears generally heal quite well, I reserve ‘shortening’ of the ear lobes for those that are really elongated,” Brooks says. He notes that this technique will result in a small scar, but it will be barely noticeable. “[It] also can be easily hidden with earrings,” he adds. Dr. Brooks explains that the healing process can be hard to predict overall, but ears generally heal well — great news for those irked by their extended lobes and intrigued by surgical options. In my case, by the end of my research, I was happy to know that there seems to be a relatively easy fix to my “x” marks. 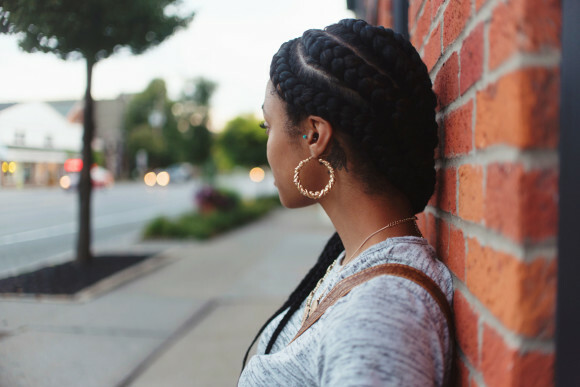 If you’re curious about cost, know that it will vary depending on your geographic location, the provider treating you, and the severity of the damage, but prices for earlobe repair tend to range from $400 to $1,000. “Don’t forget,” adds Dr. Brooks, “beauty is not generally determined by the look of the ears.” (He pointed out that most people notice eyes first, not ears.) So maybe I won’t worry about it too much just yet, but I will be covering up my treacherous lobes with earrings until further notice.